Looks like the wait is almost over for a lot of patient Sprint Android owners. 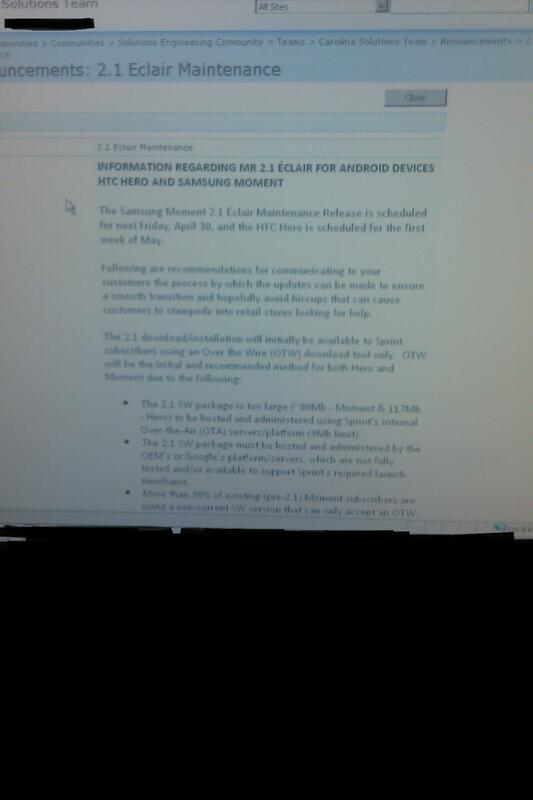 A screenshot of a official Sprint employee memo shows that Sprint is preparing for the release of the long awaited Android 2.1 update for the HTC Hero and the Samsung Moment. Actually it’s closer than you might think. According to the internal memo the Samsung Moment is supposed to get the update starting today, April 30th. I have been following the thread at XDA very closely, and it seems that all of the Moment owners are still waiting for the update to go live. Anyways, the memo goes on to say that the Hero update is scheduled for the first week of May. The other important info that comes out of the memo is that the official update will OTW, which stands for ove-the-wire. All that means is that it the upgrades will be PC-based. The is in fact due to the large size of the Android 2.1 update. Usually we see most firmware updates come OTA (over the air) but the 80MB Moment update and the 117MB Hero update are just too big for Sprint’s network. All Hero and Moment owners should be on high alert for the update, it’s still possible that the Moment update could still go live, but i wouldn’t count on it. I figure tomorrow is a better option of everyone, including Sprint. Technically tomorrow is the “first week of May” But Sprint is known for waiting till the last possible minute to meet a deadline. If we do see the Moment update released today or tomorrow, it would help to ensure that the Hero update would shortly follow. Just hang in there a little while longer guys, it’s almost here! EDIT: I forgot to mention that it will be a very good idea to backup any and all important files, contacts, mp3 or just anything you DO NOT want to loose. The upcoming OTW Android 2.1 update will most definitely require a full wipe. I would suggest a Nandroid backup now, to prepare for the inevitable. Well, it looks like the long wait for Android 2.1 on my HTC Hero is finally drawing to a conclusion. I am a bit bummed that it won’t be an OTA update, but it’s not like that was totally unexpected. Incidentally, I hope this update also fixes the MMS problem I’ve been having with receiving picture and video messages on my HTC Hero since mid March. That has really started to get on my nerves. I suppose I better archive my important information on my microSD card to prepare for the impending update. It’s funny that Android 2.1 for my HTC Hero is showing up now. I mean, Android 2.2 – Froyo will likely be out in the next couple weeks. Wow, I get to have the latest version of the OS for two whole weeks! Is this a fake screenshot like all the others? I have got’n my hopes up too many times. I had the same problem with my HTC hero’s MMS but it was fixed after I updated my prl listing and profile under the phones settings sometime in mid-April. Try that and see if it fizes the problem. If not take it to your local mobile store of your provider they may be able to help you further. Well I just got off the phone with sprint technical support and I asked about the update and the guy said in the next few days it would be coming out. He didn’t give an exact date unfortunately but there would be one soon. Okay, I’ll try updating my PRL if the Android 2.1 update doesn’t fix the MMS issue. Thank you for the advice. From what I’m reading elsewhere on the Internet, it looks like the Android 2.1 update will be released in the next two weeks and not definitely the first week of May as suggested. I’m to the point where I’ve waited this long, I don’t mind waiting a bit more if it’s a quality release with no bugs.